The iPad Air is Apple's best iPad yet. But what does that mean beyond the usual lighter, faster, everything-er that Apple typically slaps onto its latest products? The first reviews of the iPad Air have hit the Internet and we've rounded them up to give you a clearer picture of Apple's latest full-sized tablet. When I first picked up the iPad Air, I noticed how light it was. I mean really light. In reality, Apple shaved about half a pound of weight off the new iPad compared to the previous generations. That may not seem like much, but when the old iPad only weighed approximately 1.5 pounds, knocking off half a pound is significant. Despite its petite size and lightweight build, it doesn't feel at all flimsy. The unibody aluminum chassis is just as solid as on older iPads. The sides have a blunter edge this time around, so you get more of a grip than the gradually sloping edges on previous models; and Apple has added chamfered, diamond-cut edges that form a boundary between the bezel and the rest of the tablet's body, which gives it a premium look. In our experience, however, the downside to chamfered edges is that they're often susceptible to dings and scratches. We coached the iPad Air through some of our favorite benchmarks, along with a fourth-gen iPad running the most recent version of iOS (7.0.3). The results were quite compelling. In Sunspider 1.0.1, the old iPad took 661ms on average to complete the tests, whereas the new Air blasted through in 402ms average. That’s a greater than 50 percent improvement in Web rendering speed. (The iPhone 5S scored 417ms.) Geekbench 2 was similarly improved, 1,797 vs. 2,382 (higher is better here), and on Geekbench 3 the gap widened, 1,429 vs. 2,688. 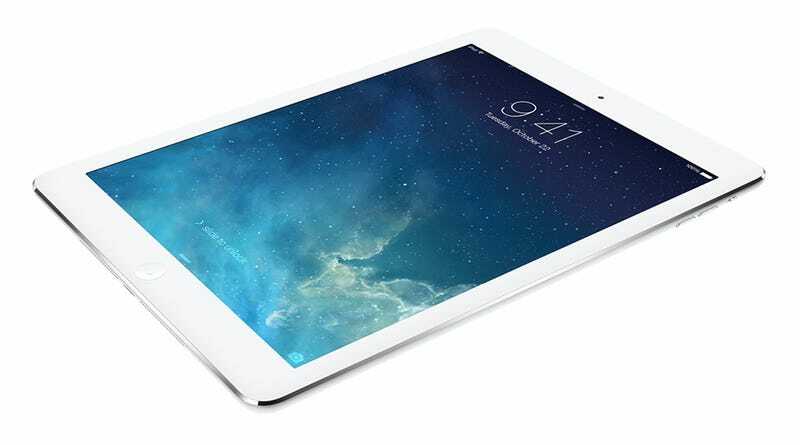 In fact, the iPad Air’s single-core score of 1,475 is higher than the dual-core score of the fourth-generation iPad. In case you’re wondering, yes, the iPad Air does get quite warm when doing this sort of number crunching. The back of the tablet feels slightly cooler at full-tilt than its finger-toasting predecessor, but there’s still plenty of heat coming off the back, reinforcement that your slinky new tablet is, indeed, working hard. Despite the boost in power, in day-to-day use we've noticed no real speed enhancements compared to the previous full-sized iPad. And that's based on tests using an array of apps and playing all the resource-heavy games we can - Infinity Blade III, Need for Speed Most Wanted, Real Racing 3, Dead Trigger 2 and others. For today, the Air is as fast as any Apple tablet has ever been: we've experienced zero lag and zero performance issues. Not once have we thought anything took too long to load, even if, in most cases, theiPad Air did win out compared to the iPad 4 in load times, but only by a whisker. Apple’s decision to unify silicon across the iPhone 5s, iPad Air and iPad mini with Retina Display is an interesting one, but ultimately it doesn’t come with any real tradeoffs for iPad owners. Apple’s own 64-bit Cyclone cores are incredibly powerful, even more so than I originally expected when I reviewed the iPhone 5s. Apple seems to have built a bigger, higher performance CPU architecture than any other ARM player, including ARM itself. The design isn’t perfect, but it’s a completely different caliber performer than anything else it competes against. As such, Apple was completely justified in putting the A7 in both the iPhone 5s and the iPad Air. If anything, I’d argue that it might be overkill for the 5s given the device’s smaller battery, but my sensibilities soon get the best of me and remind me that more performance on tap is never a bad thing. Two Wi-Fi antennas work to deliver up to twice the speed. I downloaded the pilot episode of the "Pretty Little Liars" spinoff "Ravenswood" in less than 20 minutes. It took last fall's model 39 minutes to do the same. The Air sports the same screen as the old model, so it’s obvious what Apple shrunk to squeeze it into the narrower case: the borders. As with both variants of the iPad Mini, the bezels along the left- and right-hand sides of the display (when held in portrait orientation) are now slender rails. At first, that made me nervous — I worried that my palms would intrude on the screen real estate, covering vital information and possibly even triggering features which I didn’t intend to trigger. In reality, that wasn’t an issue, in part because iOS is designed to reject such accidental input. The Smart Case makes the iPad Air feel quite a bit more bulky, in my opinion, and is fairly difficult to get off once its on. On the other hand, it’s definitely more protective than the Smart Case, and it’s still relatively svelte. Apple has also nailed its leather case designs in terms of putting out a product that feels very high quality, and that’s what they’ve done here, too.